On Tuesday, the Department of Homeland Security confirmed what we already knew to be true. "The DHS can confirm that there are individuals within the caravan who are gang members or have significant criminal histories,” Tyler Houlton said. 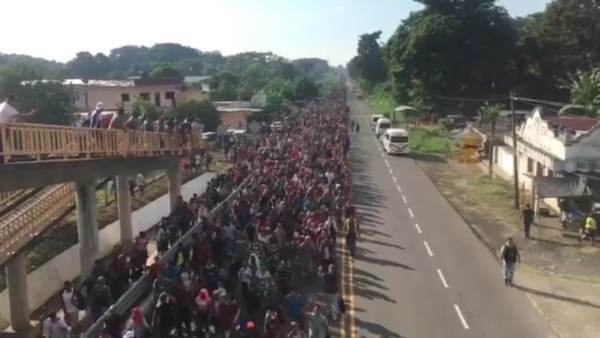 “President Trump should order criminal investigation of how the “caravans” have been organized and financed. Based on our team’s reporting from Guatemala, it is likely Americans involved,” Fitton said in a tweet on Tuesday. As usual, Trump was right. Last edited by GeorgiaPeach; 10-23-2018 at 06:05 PM. No asylum at Ports of Entry. They are not vetted, they do not have medical exams! WE are not the only country they can go to. We have a backlog of 700,000 of them that do NOT qualify and need to be deported on the spot! No letting them loose on an "Order for Removal"...load their carcasses up immediately and ship them OUT! Will Gang of Six Grant Amnesty to ex-DACA Gang Members and Criminals? 476 gang members & criminals arrested by I.C.E.